It’s dark now. It’s raining in cold sheets. Thunder shakes the earth. Lightning tears away the night, at least for a half-breath. It was on one such night, long ago, I dreamed of writing a story so deep and so dark as to challenge all books ever written. And when it was finished, I named it Tyrants of the Dead. Three books. Three individual epics. All woven together in the grandest tale I’ll ever dream of. On Dec 26th, 2001, while lounging in my chair on a bitter winter’s night, I began writing. I’d had a dream, and I needed to get it out of my head. The first words I typed were, “Morellellus, oldest harbor of Furyon, was not always so gloomy.” Many of the tens of thousands of words in the Tyrants of the Dead series would change or vanish altogether, but not these. These have always remained the same. 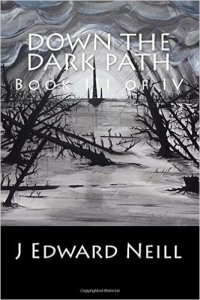 And with that… Down the Dark Path, book one in the series, was born. 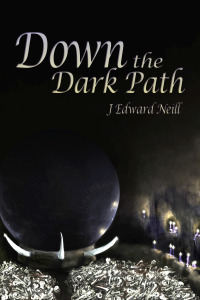 The first and (by far) the longest book in the Tyrants trilogy, Down the Dark Path is at its heart a simple story about a young woman who wanders into a world-ending medieval war. It took me more than ten years to write, rewrite, rewrite again, and finally publish. By the time I finished it in 2013, it had become much more than a tale of a girl and a war. 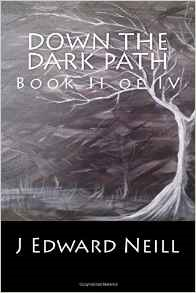 Over the years, I’d added darker and darker elements, including merciless warlords, traitorous knights, and sorcery of the blackest kind. To counter the themes of war and suffering, a love story blossomed in the middle, though whether the tale’s heroine, Andelusia, would ever survive to see her romance through became a question only answered at the utter end. After completing Down the Dark Path, two things happened. First, I considered letting one book be the end of it. After all, it was epic length, more than enough to consume three books in most modern fantasy trilogies. Second, I decided that because it was so long, I wanted to offer it in a four-novella series. Four little books would be easier to wield than one vast epic, I figured. 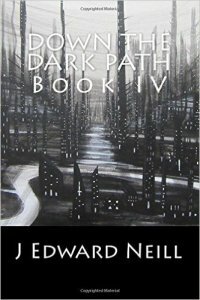 These four little novellas comprise all of Down the Dark Path. Meaning, book one in the Tyrants of the Dead trilogy can kinda sorta be four books, depending on how you read it. Remember how I mentioned I almost let this be the end of the story? Well…turns out the little feeling in my gut lasted only about two weeks. 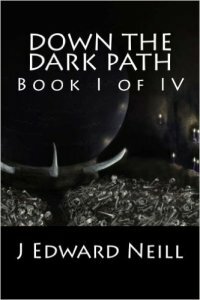 Shortly after publishing Down the Dark Path, I realized I wanted to create a true fantasy trilogy, and that I wanted it to be huuuuge. And along came Dark Moon Daughter. A few facts about Dark Moon Daughter: It’s the shortest book in the trilogy, significantly shorter than the other two entries, but no less an epic-length read. ALSO…it can be consumed as a stand-alone novel or as a prequel to the third book in the series. Meaning readers don’t necessarily have to read Down the Dark Path to get into it. In Dark Moon Daughter, I took the themes from Down the Dark Path and tightened them into a story about one person instead of many. The deeper I delved, the darker the plot became. A budding sorceress with a broken heart decides to leave an easy life behind in favor of chasing something…only she has NO IDEA what that something is. Turns out that something isn’t something good. It’s something very, very baaaaaaaaaaad. Andelusia knows she is not like other girls. 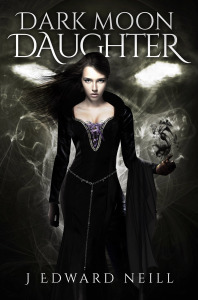 I published Dark Moon Daughter in 2014. It was my favorite of the three to write, and ironically the least ‘dark’ in the series. A few hours after successfully publishing Dark Moon Daughter, I found myself sitting in the shadows again. I was lonely without a book to write, and I needed to get immediately back to work. I’d long ago decided how I wanted the Tyrants series to end. And for all my love of such greats as Tolkien, George R.R. Martin, Rothfuss, and all the rest, I believed in my heart I could do fantasy endings better. And by better I mean more adult, more visceral, and darker than anyone had done it before. 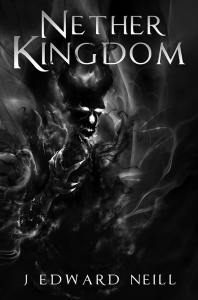 In Nether Kingdom, things go badly for every character who survived the first two books. A villain thought long-dead is resurrected. Planet-snuffing demons roam the ether, ready to remake everything in their image. No one is fully good. Plenty of people are dedicated to evil. For all of Dark Moon Daughter’s departure from pure wickedness, Nether Kingdom brought it back. I gave the bad guys a spotlight and shoved everything else into the shadows. And I really, really enjoyed writing one character in particular, whose name I shall not utter here. I published Nether Kingdom in 2015. It concluded the Tyrants trilogy. But…and there’s always a but, it doesn’t mean I won’t come back to the series someday. I have plans long in the making that include a prequel AND a two-book sequel. The only challenge: living long enough to make it happen. I hope you enjoyed this glimpse at Tyrants of the Dead. If you want a little more, I created a fun glossary of characters, places, and things from the series. Check it out. I also hope you’ll read the books. Love them to pieces. And review the hell out of them on Amazon.